| The Art & Science Of FUE Hair Transplant by Dr. Kinnar Kapadia. From the last five decades Hair Transplantation technique has been evolved. In this technique the demand and popularity of FUE is increased nowadays. Avenues is one of the best Hair Clinic in Ahmedabad for FUE which is associated with lack of linear scar and potentially faster healing time. In this procedure of hair transplant individual follicles units are extracted from the donar part and transplant them into the bald part. In FUE a patient is not exposed under risk such as big scars, pain likewise in other treatment . It is internationally recognized by the various organization and competent authority as a successor. It has very short recovery periods. In FUE there is no need for extra time for graft’s separation because operation hours is 5 hours on average. Only single session is required for covered the baldness of 85% of patients. It use the sharp punches. It will best result as there is least amount of punching. In this rotation is provided by motor , unlike the manual device. There is more twisting at the same time. For proper punch placement shaving the donar hair to 1-2 mm. Infiltration of subcutaneous tissue and apply skin traction in the opposite direction. Advance and Engage the punch. Remove the grafts and avoid taking adjacent grafts. Preparation: – The patient in clinic is made comfortable with the environment and all processess are completed for the treatment. Extraction: – In this two forceps technique is better and each hair follicle is extracted from the donar area by applying local anesthesia. Implantation: – In this care is needed during insertion. FUE grafts have lesser tissue at its base than the FUT graft and it is done by pre-made slit method. Completion: – After the procedure has been completed , a patient is prepared to return home safely. The experience and training of hair transplant surgeon is key to successful in cosmetic surgery therefore it is necessary to select a proper experience and well trained physician for performing a procedure. If they are not careful while selecting trained surgeon for FUE then a patient will experience a very bad cosmetic outcome so there is need of a patient to ask about Pre-Operative Instruction, intra-operative and post operative phases of surgery. 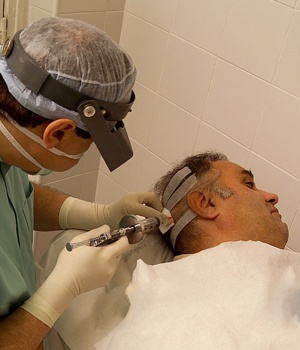 In Avenues Clinic FUE Hair Transplant method is very effective in such a way that all processes are carried out under experienced and specialize team of experts with local anesthesia. For the removal of hair follicles using tiny punches Micro removal technology is used. Hence this maintains a good will the patient so that they can share their query and the problems in different ways as per their choice.